Zipit Bedding is a sheet-and-blanket set that works just like a sleeping bag which will make both moms and kids happy. Zip bedding is fast, fun, and makes it easy for kids to make their own bed in seconds, just by pulling the zipper. Zipit Bedding is made of super soft quilting with a zippered reversible pillow case, and features side-storage pockets with designer print inside. Zipit can be washed and reused, and is ideal for those hard to make bunk beds too. Zippered side pockets make it easier to store your smartphones, ipads and other stuff. ZipIt Bedding for kids has options including Rocker Princess, Fantasy Forest, Sweet Dreams, Extreme Sports, Outer Space, and Wild Animals.ZipIt Bedding for teens has options including gray stripes, navy stripes, black checkered, pink clovers, purple hearts, red houndstooth, aqua and khaki Aztec and gray geometric.Works like a sleeping bag… you just zip it! 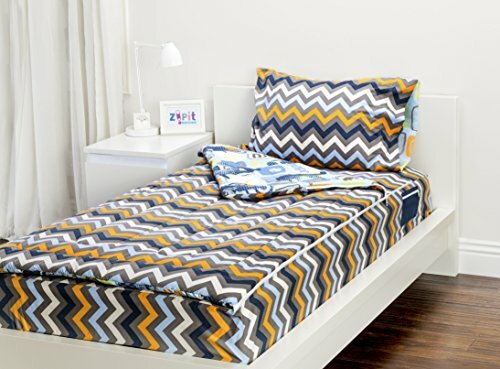 Zipit Bedding is a fitted sheet and a comforter zipped into one fast, fun, and easy unit. Available in multiple colors and patterns, and in full, twin, twin extra long, and queen sizes. Perfect for hard-to-make bunk beds, college dorm beds, trundle beds, murphy beds, squishy air mattresses and more. It’s back to school season! Twin and twin XL are the most common sizes for college dorm mattresses. Zipit makes laundry simple too. Simply strip it off the bed, wash, and re-fit as one unit.